If there’s one thing to be said for Curiosity’s mission on Mars so far, it certainly hasn’t been boring. Although the six-wheeled rover has taken thousands of photographs of Martian rocks, the rich diversity of Mars’ landscape has provided many beautiful examples of planetary geology and some geology that is downright weird. Take this recent photographic example from the Mars Science Laboratory’s Mastcam camera that was uploaded to the mission’s photo archive on sol 746 (Sept. 11). While compiling a mosaic of images of the surrounding landscape, Curiosity captured a rather un-Mars-like shape atop a rocky outcrop. There’s a perfect-looking sphere sitting proudly on a flat rock surface. It’s dusty, but under that dust it appears a little darker than the surrounding rock. At first glance it looks like an old cannonball or possibly a dirty golf ball. But knowing that Mars is somewhat lacking in the 16th Century battleship and golf cart departments, there was likely another answer. Of course it’s nothing man (or alien)-made, despite what your brain might be telling you. It’s another fascinating rock. 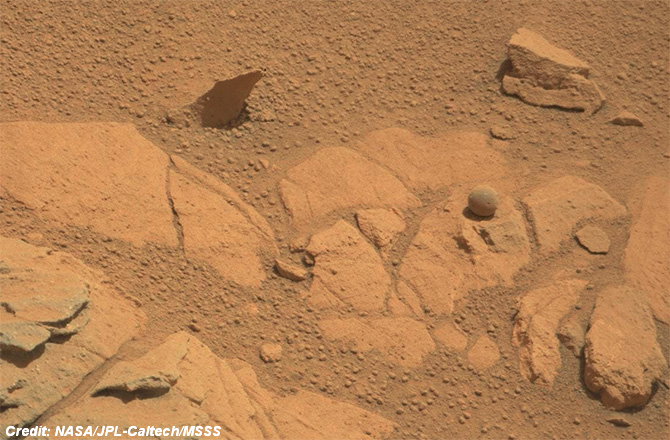 Yep, it’s a spherical Mars rock. . . .